All the information about the wedding ceremonies hush-hush for those they didn't want to come, but as your neighbourhood good snoop that we are, we were able to know that the engagement/traditional wedding was done on Thursday and that the actual wedding was on Saturday, April 13, 2019 and then the private party of all private parties, the Groom's party was on Sunday, April 14, 2019 in Ikoyi, Lagos. Party still ongoing as this report was published. 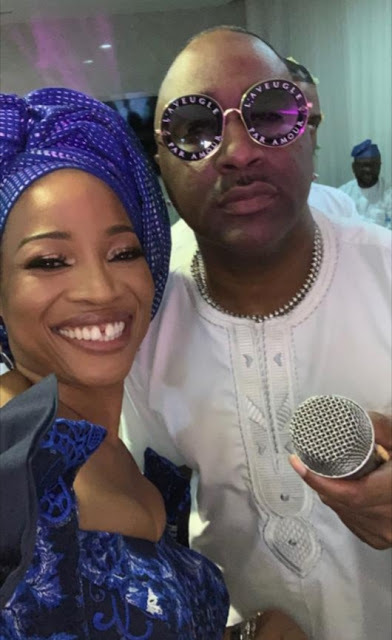 The duo had apparently decided that it was better to have a so-called 'low profile' wedding ceremony in quote than a loud celebrity one with all the attendant noise. What with Aigbovbioise being in his 40s, that's middle or late 40s say about 48 at that and Funke doing this same thing a 2nd time around and clocking about 35. 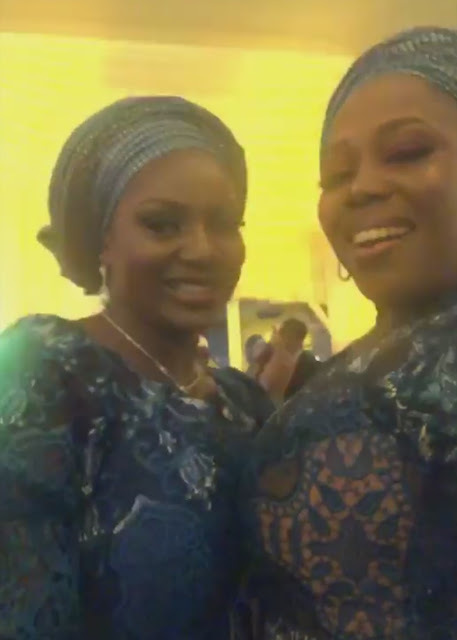 So though devoid of the so called 'expected razzmatazz' like Funke's 1st one that was extremely loud for a purpose, like Nigeria's own version of Princess Diana got married then, it was still class and distinction all the way. But we heard that to enter the Oriental Hotel, Lagos venue of the Saturday part of the event was like a camel passing through the eye of the needle! The security to say the least was 'unbecoming'. That party from what we heard was more of a Fowler thing. Though if these series of ceremonies are what people generally refers to as 'low profile', then it beats hands down, many of the very loud ones then without a shadow of doubt. This one & by that we mean the couple like you all already know very well, is good money jam super the good money ooooo, so equation is balance all the way as it is 1-1 scoring draw. This dude here, by name Aigbovbioise is not in any way reliant on daddy's funds at all, you can easily follow his trail and see that the University of Buckingham graduate has risen gradually to the pinnacle of his career and his still growing. Funke's dad on the other hand, is probably one of Nigeria’s 'most liquid' Nigerians alive, as he heads the FIRS-that is, 'Federal Inland Revenue Service', one of the cash cows of the Federal Government, a station where he has performed magic, having left the LIRS-'Lagos Inland Revenue Service', where he had shown great mettle at delivering very well on the job. Funke on her own is quite a successful Fashion/lifestyle Entrepreneur. "Aig the younger" like we prefer to call Aigbovbioise (he is the last born of 4 kids of Pa Frank Aig-Imoukhuede the renowned veteran journalist, poet & playwright), was named after his 'paternal grand-dad' of yore, the Late Pa Isaac 'Aigbovbioise' Imoukhuede, who had passed on since May 1, 1938 long before any of Pa Frank's 4 kids-'Erekpitan, Aigboje, Oluwakemi & Aigbovbioise' were born and on his own, Aigbovbioise is a super okay dude by all standards, but he is also backed by an older brother, the 2nd born child & 1st son at that, who is a super multimillionaire in good currency by name- Aigboje, the 'former CEO of one of Nigeria’s top 5 banks in terms of all ramifications, that's talking about Access Bank Plc and who was also the former President of the 'Nigerian Stock Exchange' and he is currently the chairman of 'Coronation Capitals', the owners of the 'Coronation Group', owners of 'Coronation Merchant Bank', 'Wapic Insurance Plc' & other investments. The elder Aig's (AIG the elder) London home/mansion in a very tush area is said to be a statement in absolute class (that's a story for another day though). 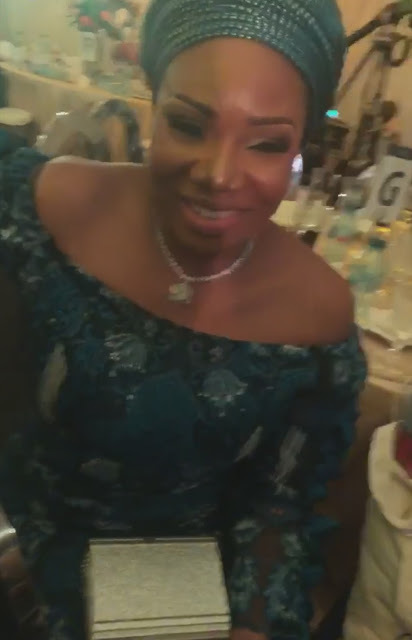 And then also Aig's 2nd sister 'Oluwakemi Balogun', infact his immediate elder sister, a business tycoon, is the wife of 'Bolaji Balogun', the MD/CEO of 'Chapel Hill Denham', one of 'Nigeria’s top 5 financial advisory services firm', who is the gentleman 1st son of the 'incredibly stylish banker of note and head or leader of the Omoobas (princes) in Ijebu', the one and only, "Otunba Olasubomi Balogun". So though Funke is coming in big, her man is also very well sat too in all ways & manners. This Sunday Ikoyi party was an epic one by all standards. 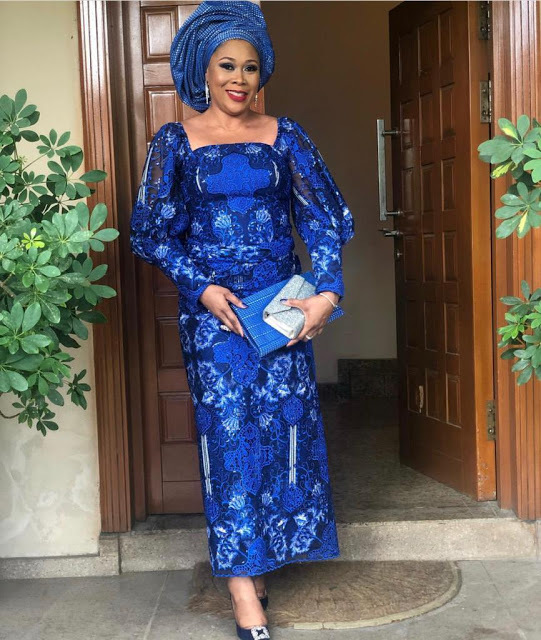 It held somewhere in Ikoyi, more accurately at a private property owned by Aigboje on Gerrard Road, Ikoyi Lagos and the color of choice or of the day was 'Cobalt-Blue', which we heard reliably was supplied by none other than Temilade Remi-Adeoye of 'Kwamule Fabrics', who since she came on the scene has become the go to for the best fabrics for all occasions and events in Nigeria. Her store we hear is the mecca as people storm the place to source for exquisite fabrics of distinction for their parties, events & occasions. Imoukhuede, the elder brother of the groom. Though a private party, it had KSA, yes that's the King himself on the bandstand performing and dazzling all. He always still does his thing, when it is the highest caliber of society that's involved and this combo the Imoukhuede's and Fowler's perfectly fits into that mold. 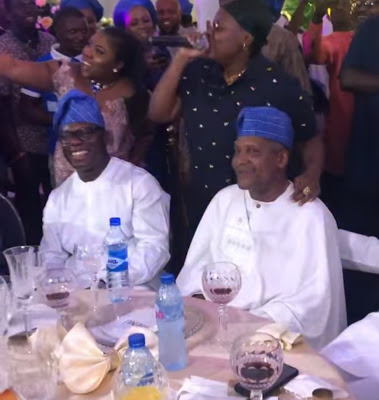 When an Aliko Dangote, a Jide Sanwoolu, Prince Dapo Abiodun Wale Tinubu et al are at a party how more upscale can a party be? But it just wasn't KSA on the bandstand though, there was also that American singing group of yore by name '112' that were also there to entertain too to the delight of all. 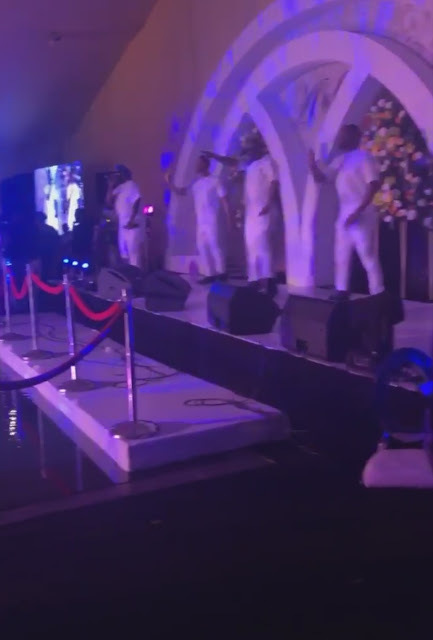 The quartet wore a white native attire of Buba & Sokoto to perform a medley of their hits. Though much more mature now, they still gave a great account of themselves, singing and at the same time stepping to the beats in tandem. They used to be one of the best R&B group then in the early 2000s. Then also there to perform was the rave of the moment, the super talented Teni, this gal Don blow ooooo ooo, we especially loved how she sang that her popular song where she mentioned Dangote, "but my papa no be Dangote" to the richest black man in the world, who laughed in delight, as the smart gal changed the lyrics claiming Dangote now has a new daughter. 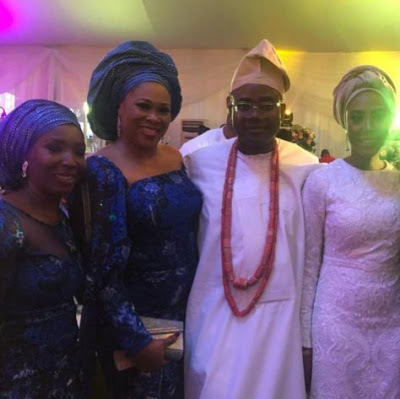 The guest list was quite intimidating to say the list, it was Aigboje's party now, so what could one have expected? Just imagine a party where all the 'captains of industry' were in attendance. Apart from Aliko Dangote, there was Wale Tinubu, Governor elects- Babajide Olusola Sanwoolu, Prince Dapo Abiodun and loads more. All friends of Aig the elder. 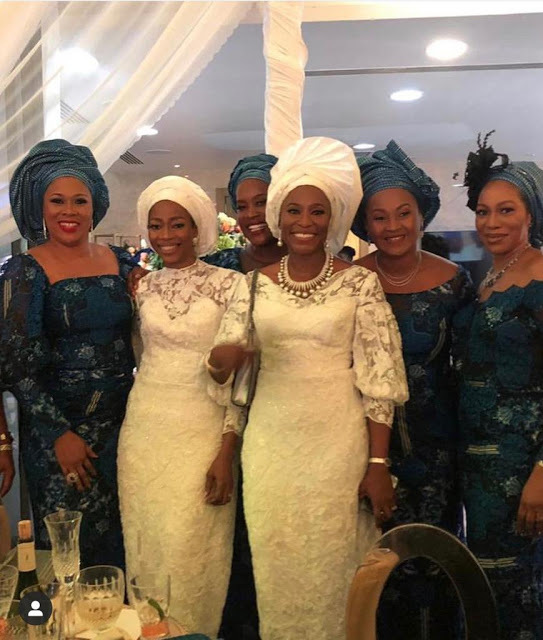 The new, gorgeous wife had a few of her friends in attendance too, likes of Lamide Shonekan, Ada Akinrele, Bimbo Oladapo, Lola Ashafa. 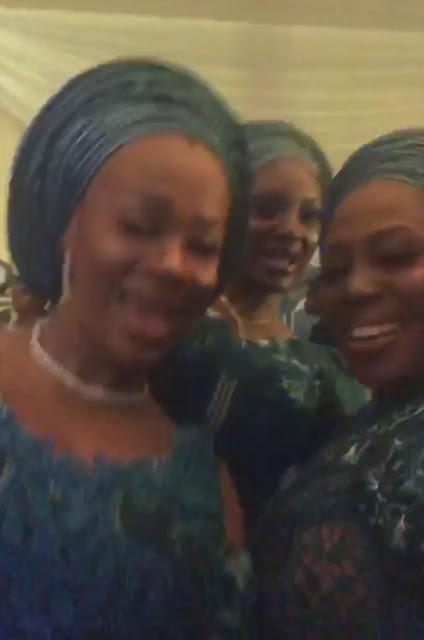 Other young guests we also saw were Lara Rawa, Temilade Remi-Adeoye, Aisha Kolawole and many more. If you want a small private party without much noise, then this one with about 500 people only, is as small as they come. Sponsored by big bro, Aigboje Aig-Imoukhuede. 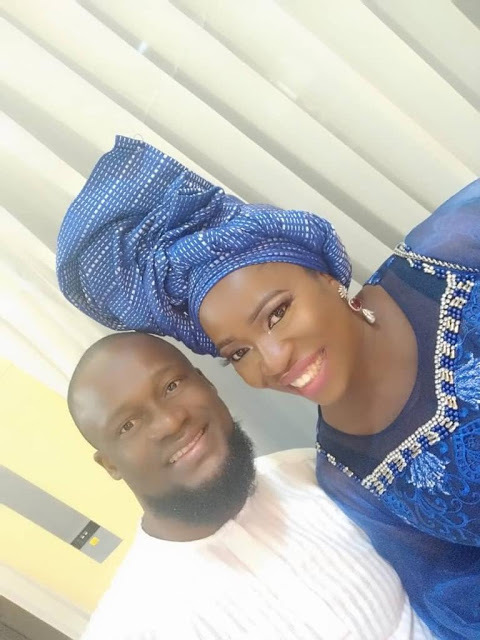 The event was packaged as expected by Funke Bucknor-Obruthe's 'Zapphaire Events', bride's make up as expected was done by none other than the biggest and the best in the land, Celebrity make up artist-Banke Meshida-Lawal. All in all, it was a totally off the hook, very upscale, Sunday evening party. Again we say congratulations to the couple.